How much sun exposure is good for you and when does it become bad? The intensity of the sun's UV rays that reach the Earth's surface varies and should be considered when you plan being exposed to the sun while outdoors. After many attempts by meteorological experts across the globe to create a sunburn index, together with increased worries about the expanding ozone hole, the first UV Index was created in 1992 that calculated UV predictions for the next day. 2 years later The World Health Organization created a global standard UV Index with uniform calculations and standard colors. It essentially measures the strength of the sunburn-producing ultraviolet (UV) radiation at a particular place and time. This is usually available from local weather stations, radio programs, web sites or newspapers. The higher the UV Index forecast, the stronger the sun's rays will be and therefore the more urgent the need to follow all the sun protection prescriptions. Occasionally there are days when the UV Index spikes to an unexpected high for a particular geographic location, and so a UV Alert will be issued. There are an increasing number of UV Index focused Apps available too. Some web sites allow you to sign up to receive a UV Alert or if you prefer, a daily UV Index forecast for specified areas. This may or may not appeal for your day by day activities but is usually helpful when holidaying or visiting a geographical area you are not too familiar with. 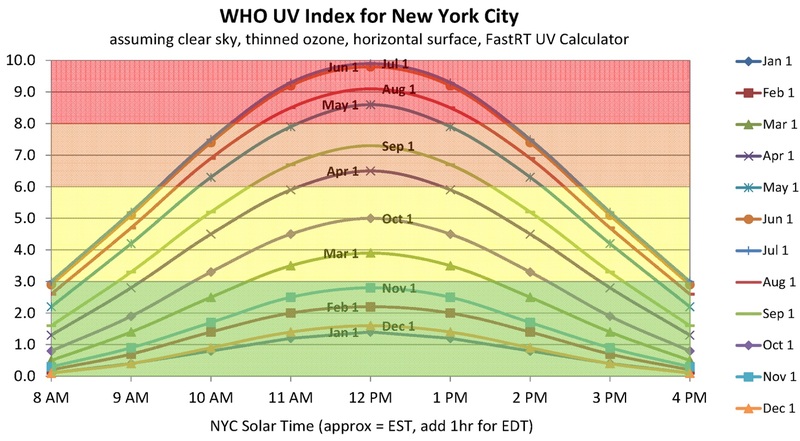 Predominantly, UV strength will be at its highest from 10 a.m. to 4 p.m. when the sun's rays are the most direct, and especially during summer. Another aspect affecting UV strength is latitude and altitude. 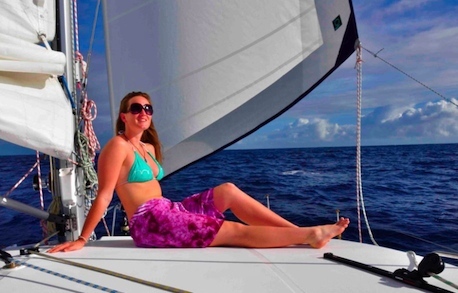 UV exposure is greater in the low latitudes, ie. nearest to the equator, and at high altitudes. Being on water, snow or sand also increases your exposure by the reflection of the UV rays. Thus water or snow skiers, yachtsmen or boaters, and anyone at the beach or out in the desert, will take extra precautions by wearing suitable sun protective clothing, hats and plenty sunscreen. 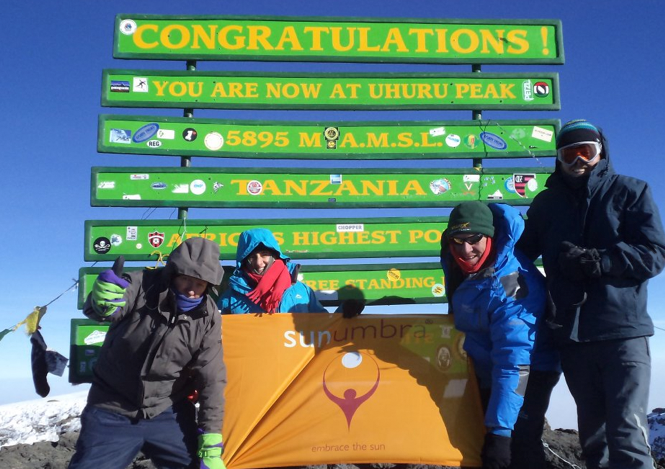 Thus a great test for sunscreens is at the equator, on top of the highest peak in the snow! Some people, regardless of race or ethnicity, are more vulnerable than others when exposed to the harmful effects of the sun. Your skin type will affect the degree to which your skin burns, as well as the time it takes for you to burn. 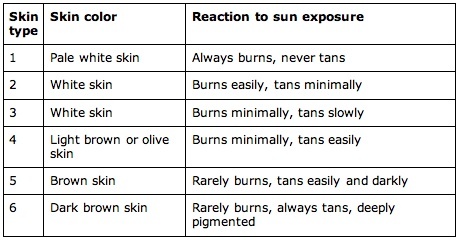 The same people who are more likely to burn with excess sun exposure are also most vulnerable to skin cancer. Studies have shown that individuals with large numbers of freckles and moles also have a higher risk of developing skin cancer. However, although those with skin types above 3 have a lower incidence of skin cancer, they are still liable to get a sunburn and should still take precautions. There are far too many examples of the deadly melanoma with dark skinned people and through the perceptions of their not having to be concerned, the diagnosis is often in the later stages when it is more dangerous. There are some diseases, such as lupus, that create extra sensitivities to being exposed to the sun, which can result in sunburns. Also, some medications such as antibiotics or antihistamines, can initiate extra sensitivity to the sun's rays. Please discuss these issues with your doctor in terms of extra precautions. Minimal sun exposure can be really good for you as the skin will create Vitamin D, but if you are an avid sun bather or someone that spends a lot of time outdoors, the sun may end up being your worst enemy. For those that go without sunscreen or sun block while out in the sun the risk of a sunburn is greatly increased. While many treat sunburn as a minor nuisance, the worse the sunburn, the more likely your chances of developing skin cancer are. There are non-cancerous forms of skin cancer but regardless of whether it is benign or malignant, I don't believe it is worth taking a chance with your health. If you don't practice sun care habits now, your best bet is to start sooner rather than later. It is often easy to spot individuals that are suffering from too much sun exposure. tough, roughly textured skin that looks almost leathery in appearance. These are definite signs of skin damage that occurred as a result of excessive sun exposure. When the skin gets to this degree of damage, it is very difficult to eliminate or reverse. So, practice good suncare habits with sun-protective clothing and a hat, together with a quality sunscreen. When outdoors, wear sunscreen and don't be mean in your application of it - the more liberal the application the better the effectiveness of it. So put plenty on! Zinc oxide sunscreens scatter UV light rather than absorb it and yield fewer allergies, so in general are preferred for children or those with sensitive skins. Plus they provide the best UVA protection by far.